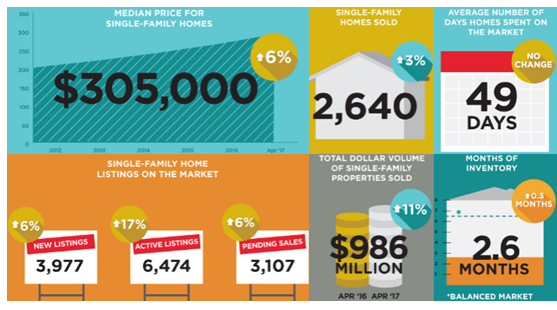 ​​​​​AUSTIN – There were 2,640 single-family home sales in the metro in April, up 3.2 percent from the same month in 2016, according to data released by the Austin Board of Realtors. Listings were up by nearly 17 percent in April and there were more than 14,000 home starts in the first quarter. Median price increased 5.8 percent year-over-year to $305,000—the second-highest monthly median price ever recorded in the metro, according to the Austin American-Statesman​—and the number of active listings climbed 16.9 percent to 6,474. ​Check out housing data from other Texas cities and the United States at ​Prudential Ada, Realtors​.